Imagine getting up early on election day having done your homework on the issues, educated yourself on candidates’ positions, and chosen whom to vote for, only to find poll workers who do not know how to turn on, set up, or assist you in using the voting machine. That is exactly the type of story we at Disability Rights Pennsylvania heard, along with a host of others, during the last presidential election in 2016 when we ran a hotline for disabled voters. During the 2016 election, less than 20 percent of polling places were accessible to people with disabilities. Some voting systems rarely had instructions included, others lacked tactile buttons for people with low vision, and for some systems, the voters could not verify that the ballot reflected their choices. For these reasons, voter turnout for people with disabilities remains under 50 percent. According to the American Association of People With Disabilities, 16 million of the eligible 35 million voters with disabilities cast a ballot in the 2016 election. With election security on the minds of legislators, there is fear that changes to polling technology will only further disenfranchise citizens with disabilities in the coming election. Pennsylvania Bills S.B. 411-419 have been introduced in the House and Senate to update and reform the election system. This comes as counties and the disabled across the state test new voting systems that create a paper trail through different formats. Full Article: New voting security measures could disenfranchise voters with disabilities | Opinion. Full Article: Thousands With Disabilities Have Lost the Right to Vote - WhoWhatWhy. When it comes to expanding voter access, most often the conversation centers around allowing early voting or establishing automatic voting registration. But a forum at the University of Delaware Tuesday focused instead on making voting more accessible for those with disabilities. “We still have this cultural lag where we don’t really expect people with disabilities to be voters,” said Rabia Belt, historian and assistant professor at Stanford Law School. “It’s still quite difficult for people to be able to access polling places, people to receive the accommodations that are legally mandated.” The forum organized by UD’s Center for Disabilities Studies looked at how people with disabilities are underrepresented at the polls. Full Article: Majority of disabled voters in U.S. faced challenges in casting ballots in '16 : Politics & Policy : WHYY. Officials in a majority-black Georgia county accused of trying to close almost all polling places to make it harder for black people to vote claimed last week that the locations couldn’t be used because of accessibility problems for people with disabilities. But Randolph County doesn’t have a single recent report, analysis or document supporting the idea that it needs to close seven of its nine polling places due to accessibility issues, a lawyer for the county told HuffPost on Tuesday in response to a public records request. HuffPost requested records from the county dating back to March 1, 2018. The county hired Michael Malone, an outside elections consultant now pushing for the closures, on April 2. But according to the county, it has no written record of evidence to back his recommendations. “There is no document, report or analysis studying the handicap accessibility of polling places in Randolph County and the cost of fixing them within the time frame specified in your open records request,” Hayden Hooks, an attorney with the firm Perry & Walters, which represents Randolph County, wrote in an email. The county has no record of such a document in the past year, Hooks added. Full Article: Georgia County Can't Back Up Its Excuse For Plan To Disenfranchise Black Voters | HuffPost. New voting machines in Michigan may cause problems for residents with a visual disability. Tuesday’s primary election will feature $40 million of new equipment that replaced aging voting machines, The Detroit Free Press reported. For more than a decade, blind voters in the state have used AutoMark Voter Assist Terminals, which have a touch screen and a keypad with Braille. A 2015 survey estimates that about 221,000 Michigan residents have a visual disability. Most Michigan counties will now use Dominion Voting Systems, which don’t have keypads with Braille and feature verbal instructions that can be difficult for a blind person to follow. Some counties selected new equipment from Election Systems & Software or Hart InterCivic. About 100 blind people helped test out the three systems in 2016, said Fred Wurtzel, who is blind and is second vice president of the National Federation of the Blind in Michigan. He said most testers preferred the Election Systems equipment, while many said the Hart InterCivic were the most difficult to use. Full Article: Blind Michigan voters may struggle with new voting machines - Fairfield Citizen. Sedgwick County leaders are optimistic a law will be passed this year that makes sure voters with disabilities can vote by mail. County commissioners have backed two bills in the Kansas Legislature clarifying that voters who can’t sign their mail-in ballot envelopes will still have their votes counted. State law already allows voters to receive assistance filling out their mail-in ballots if needed. One of those bills — sponsored by Sen. Oletha Faust-Goudeau of Wichita — passed unanimously through the Senate last week. Sedgwick County Commission Chairman David Dennis says he thinks there’s a good chance it’ll pass through the House just as easily. Full Article: Mail Ballot Bill Clarifying Disabled Voters' Rights Moves Through Kansas Legislature | KMUW. The state will “effective immediately” begin making it easier for disabled Texans who receive job training to register to vote. The action comes after a disability rights group threatened to sue last week if changes weren’t made. The Texas Workforce Commission said in a letter they will begin the process of implementing voter registration services to disabled Texans served by its Vocational Rehabilitation Program. “Please note that the State of Texas … is committed to making sure that all eligible Texans have the opportunity to register to vote, including Texans with disabilities,” the TWC and the Texas Secretary of State office wrote in a joint letter this week. Full Article: State acts to ensure disabled Texans are able to vote - San Antonio Express-News. The Kansas Senate on Thursday moved to fix a state elections law that Sedgwick County officials cited last year when they threw out 23 disabled Kansans’ votes in a local election. Senators voted 39-0 in favor of Senate Bill 264, which clarifies disabled and elderly voters who may need assistance filling out their mail-in ballot do not have to sign it. The bill still faces another vote to pass the Senate. Sen. Oletha Faust-Goudeau, a Wichita Democrat, brought the issue after the Sedgwick County Board of Canvassers decided to throw out 23 advance ballots because disabled voters had not signed them. Current law says that voters are required to sign their advance ballots. Full Article: Kansas Senate votes to fix elections law after Sedgwick County throws out votes. Lawyers for a disability rights group are threatening to sue the state for failing to provide voter registration services to Texans with disabilities who obtain job training from state agencies, a violation of federal law, according to a letter sent Monday afternoon. The letter, from lawyers with the Coalition of Texans with Disabilities and the Texas Civil Rights Project, states that under the 1993 National Voter Registration Act, Texas is mandated to make it easier for disabled people to register to vote if they receive job training from state agencies. Full Article: Disability rights group threatens to sue Texas over voter registration - Houston Chronicle. The State Government has approved the use of VoteAssist, a computer-based application developed by the Western Australian Electoral Commission for its 2013 state election. The software uses specially designed computer terminals, headphones and a numeric keypad to provide audio prompts to guide the elector through the voting process. The Government passed legislation last year to introduce electronically assisted voting technology. The legislation was prompted by recommendations made by the Electoral Commission following the 2010 and 2014 state elections, calling for a trial of alternative voting for some electors. Full Article: Vision-impaired voters to have access to electronic voting at state election. Last November, nearly two dozen mail-in ballots cast by disabled voters got tossed away in Sedgwick County. Some state officials say local election authorities misread a technicality in state law, and the votes could have been counted. Now Kansas lawmakers are pushing through bills aimed at wiping out any confusion — and making sure that people who have trouble filling out their own ballots can still vote by mail. One bill aiming to clarify the law has passed the Senate. Another measure drew no opposition in a hearing in the House on Monday. Full Article: Bills Clarify That, Yes, Kansans Who Have Trouble Signing Their Names Can Vote By Mail | KCUR. For decades, Kathy Hoell has struggled to vote. Poll workers have told the 62-year-old Nebraskan, who uses a powered wheelchair and has a brain injury that causes her to speak in a strained and raspy voice, that she isn’t smart enough to cast a ballot. They have led her to stairs she couldn’t climb and prevented her from using an accessible voting machine because they hadn’t powered it on. “Basically,” Hoell said, “I’m a second-class citizen.” The barriers Hoell has faced are not unusual for the more than 35 million voting-age Americans with disabilities. 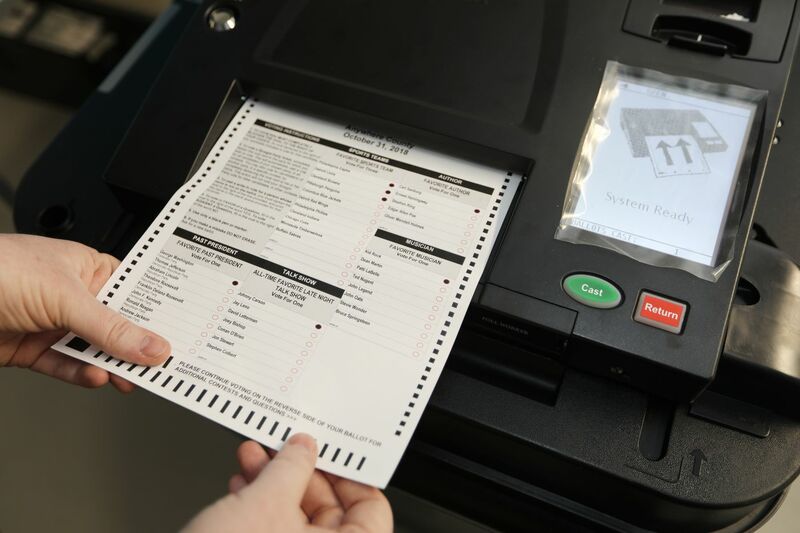 As many jurisdictions return to paper ballots to address cybersecurity concerns — nearly half of Americans now vote on paper ballots, counted digitally or by optical scanners — such obstacles are likely to get worse. Full Article: How Voters With Disabilities Are Blocked From the Ballot Box. A Kansas law requiring disabled voters to sign their advanced ballots must go after Sedgwick County officials threw out 23 votes last fall, state officials said Thursday. Current state law requires voters to sign their advance ballots even if they are elderly or disabled and need help filling out the ballot. Sedgwick County officials reluctantly threw out 23 such ballots this fall, according to the Wichita Eagle. Critics say that law discriminates against disabled people, and senators debated a bill to fix it. Kansas Secretary of State Kris Kobach’s office also vowed to change its rules and regulations to solve the issue. Full Article: Kansas senators debate election law change for disabled voters. The head of President Donald Trump’s election fraud commission drafted a law as a Kansas official that led to 23 disabled people not having their votes counted in a recent local election. The disenfranchisement occurred in Sedgwick County and was a direct result of a law pushed by Kansas Secretary of State Kris Kobach, a member of Trump’s voter fraud commission, which requires disabled voters’ signatures on their ballot envelopes. Until Kobach’s Secure and Fair Elections (SAFE) Act passed in 2011, ballots were not tossed if a disabled person’s signature did not exactly match one on file or if someone else signed on behalf of a physically unable voter. As a result, 23 unsigned ballots from disabled people were tossed in a local election where only 24,120 votes were cast according to deputy elections commissioner Laura Bianco. Some of the races in the county were decided by far fewer than 23 votes. Full Article: Disabled Americans Lost Voting Rights Under Trump Election Fraud Commissioner’s Law. A federal appeals court on Monday revived a lawsuit filed by a national advocacy group for the visually impaired against Ohio Secretary of State Jon Husted that says the state’s voting regulations violate the Americans with Disabilities Act. The National Federation of the Blind’s 2015 lawsuit alleges that the state’s system of only allowing absentee voters to cast their ballots on paper infringes on the right of blind people to vote privately and independently. Senior U.S. District Judge George Smith had dismissed the lawsuit, which also included three blind Ohio voters as plaintiffs, before either the advocacy group or Husted had conducted any discovery. A three-judge panel from the 6th U.S. Circuit Court of Appeals in Cincinnati said the dismissal was premature. The 6th Circuit’s decision means the case will be sent back to Smith to be litigated. Full Article: Lawsuit against Jon Husted by blind Ohio voters is revived by appeals court | cleveland.com. A legal dispute over when Ohio deprives blind voters of their right to a secret ballot must be heard in federal court, an appellate court ruled Monday. Because blind voters must seek assistance from sighted individuals to fill out the paper ballots set aside for the sight-impaired, a three-judge panel of the 6th U.S. Circuit Court of Appeals declared that a district court judge must consider factual claims contending that Ohio deprives them of their equal opportunity to vote privately and independently. Judge George Smith of U.S. District Court had ruled in favor of Secretary of State Jon Husted, noting that the changes proposed by groups representing blind voters would fundamentally alter Ohio’s voting program. But the appellate panel essentially said Smith should not merely have taken Husted at his word. Full Article: Court says Husted must prove Ohio can't accommodate blind voters.